Willem over at The College of Mythic Cartography and my own podcast on icebreakers led to a discussion about teach people through games, specifically teaching people games through games. Breaking down all the components of a game into easy to digest and fun to learn steps. 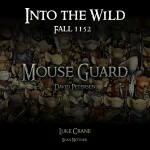 Mouse guard is set in a medieval setting that constantly challenges mice for survival. The Guard has established a territory that they keep safe, but toil day in and day out to do so. Human civilization is not present, but the war with the Weasel overlord just ended and many other natural enemies threaten every mouse every day. What is life as a mouse in the territories like? What kind of threats must the Guard protect against? What challenges must you face? A game that young mice play when they are trying to scare each other. Name something scary then pass the mouse ball to another mouse. We start a round with one person saying a word that they think threatens the mice and then pass that word to another player. The player repeats the word and then says another word that it makes them think of and send it to another player. There are no wrong answers, but we stop when one player stalls. We start a new round with the person that hesitated and continue for three to five minutes, focusing on the daily life of a mouse. Between rounds ask if people are stockpiling answers or judging words. Encourage them to let the words inspire them to the next word instead. There are no wrong Mouse words. Participate myself and get in the mood as well. Establish the mindset of a guard “Send any mouse to the job and it may or may not be done. Ask the Guard to do the task; even death cannot prevent it from completion”. Thankless heroes who exist outside society, the Wild West Gunslinger, the Samurai, the Ranger of Middle Earth. 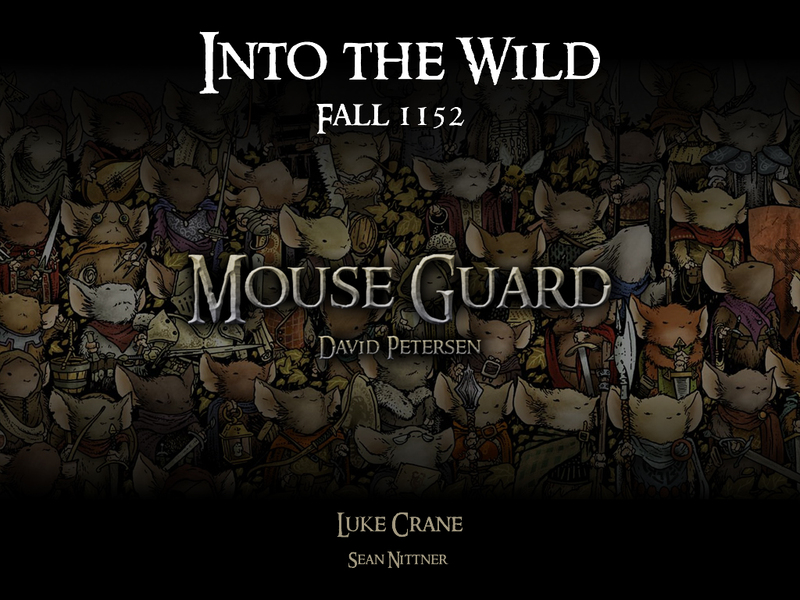 I explain that this has a real “in game” effect that a mouse of the guard never fails to achieve his goals, he just faces complications around the way. Three (of four) players take the role of veteran guards who will be the mentors of the characters they play. The fourth, picks a tenderpaw (green recruit) who will be played a veteran in the upcoming game. The veterans pick cards from a stack of weather, wilderness, animals or mice and describe a thematic element involving their card and give a name. Next player tells the shortest possible story incorporating the thematic elements and the names provided. At this point we begin engaging the mechanics, with a simple test that has no modifiers. If they succeed, they play their thematic element card and present another challenge for the next mentor, If they fail, their current challenge is complicated by another event and the next mentor steps in to help, this time we introduce the helping dice. The game caps with the Apprentice, who takes on one final challenge and either wins (by hitting the roll) or more likely looses (as their die pool is small and by this time the obstacle rather high) and succeeds in their task but suffers condition. Adding one die mechanic complexity at a time. Create the names of the patrol (NPC mentors or PC appretices). Establish the structure of GMs Turn and Player’s turn. (Taken from Judd Karlman, Justin Evans, Ken Hite and Ryan Macklin who have all used NPCs to both set up the adventure and teach players how to play). Read the motto “It’s not what you fight; it’s what you fight for” and start the fight that the Epic Journey had been building up to. Fights are the easiest conflicts to explain because the weapons are on the conflict sheet and all the actions make intuitive sense (Attack, Defend, Feint and Manuver). The players scripted their goals and stepped through the conflict system, each character taking a turn at leading the action with support from the others. To expedite the conflict (they can be long as a training I wanted to keep it concise) I ask each player to narrate a bit of awesomeness that their mouse does, then I do the same for their opponents, and then cut both sides disposition in half, rounded down. I want the “Defend” maneuver to be immediately useful (which is generally isn’t when you are at full disposition). The conflict was bitchen and the results really charted the game from then on. We got more practice using skills, wises, teamwork and traits. We also introduced conflicts, fate, persona and compromises. Practice using skills, wises, teamwork and traits. Get players excited to pick up where the NPCs left off. Collaborative Character creation (Taken from Mythic Cartography amd Justin Evans’ aspect hand outs). I Hand out character templates: Patrol Leader, two patrol guards and a tenderpaw. Name, belief, instinct, goal, and traits are blank. Each player picks a name from the previous exercise and then we start giving them traits. There are 12 cards on the table, each with a trait. Going around the table each player says “I see…” and includes another character and a description that includes one of those traits. Then hand the trait to that player. A collaboratively created cast of mice. Each mouse has a final trial before being made part of the guard. We play through a solo challenge to see how they have changed and form a Belief and Instinct. Based on the traits assigned (and who assigned them) each player asks a question about their mouse. “Am I brave enough to face the enemy?” “Do I think with my heart or my head?” and then Frames a flashback scene to find the answer. We roll a single test and from that pick a belief and instinct. Meet Gwendolyn. Receive orders. One character receives the order. All players create goals and roll out!